A talented wide receiver with a close Kentucky connection has entered the fluctuating transfer market. Last night La’Michael Pettway announced he is leaving the Arkansas football program. 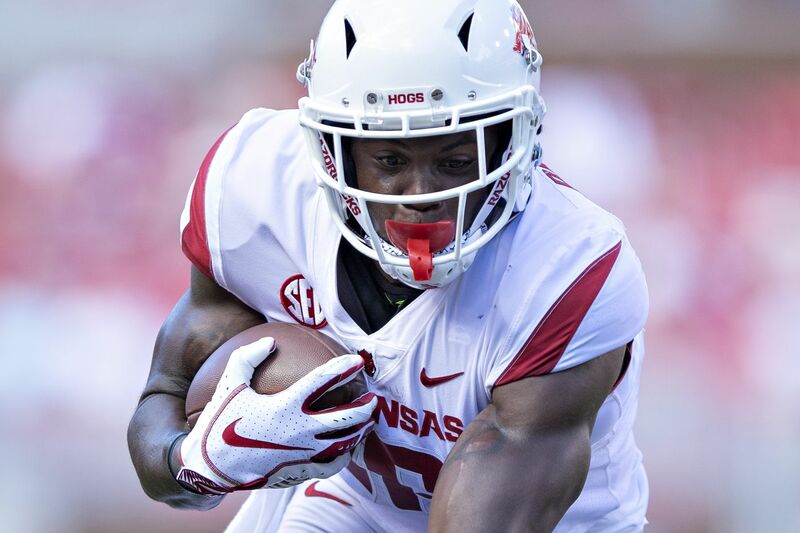 A 6’2″ 220-pound wide receiver, in 2018 Pettway caught four touchdown passes and led the Razorbacks in receiving yards (499) and receptions (30). Pettway plans to graduate, giving him immediate eligibility for the 2019 season. As Kentucky searches for more options at wide receiver, Michael Smith could turn to one of his former players. The UK wide receivers coach was Pettway’s lead recruiter when he was a four-star prospect out of Nashville High School in Arkansas. Kentucky is searching for wide receivers and defensive backs to fill out its class in the February National Signing Day. If the Cats cannot convince Devonta Lee to leave Louisiana, Pettway could be UK’s next best option for an impact wide receiver in 2019. In other college football transfer news, Jalen Hurts will be an Oklahoma Sooner. Meanwhile, Oklahoma is blocking Austin Kendall’s transfer to West Virginia. I think it’s now safe to say if Neal Brown never left Kentucky, Kendall would be a Wildcat. Another quarterback is on the move, Florida State’s James Blackman. The other high-profile quarterback on the move to Florida, Miami’s Tate Martell, could potentially push Jarren Williams out the door. Prepare for part six of that epic saga to unfold in the coming weeks. Same. There might be some behind the scenes stuff we don’t know about, though. Ironic that Oklahoma got the Big 12 rules changed so Baker Mayfield could transfer in from Texas Tech, but are preventing a graduate from going where he want. If a coach can go anyplace he wishes at anytime, a graduate player should be allowed the same. It’s very petty to not let them go where they wish. Not hard to see why we don’t get top WR prospects, just watch a Gran called game and they go to any other team. A WR at UK gets maybe 2 passes thrown his way a game and both probably at the line of scrimmage, maybe 1 pass thrown more than 15 yards deep every 3 games or so. They will line up to come here for that. So his time as OC at UC doesn’t count? How bout if you can’t say something good then say nothing at all about Gran. In other words STFU! Davis I hear ya, those three with the good hands they have, would be great for Terry. Good passers have good receivers!! Just can’t make myself care about this. Transfers that turn into non-transfers have been more frustrating than kids that de-commit. UK needs all the talent they can get but there isn’t any point in being interested in this kind of news until the player enrolls at UK. We have receivers now that are fighting over the 12 pass attempts PR game, and half of those are going Bowdens way. Why do we need more receivers? I wish Jalen the best of luck, he’s a classy young man, Oklahoma should feel fortunate.